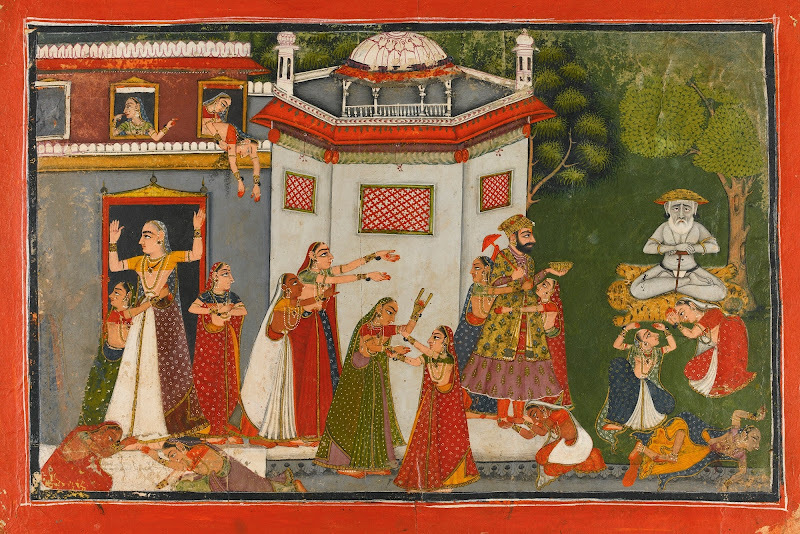 This scene of a famous episode (see below) is painted in a distinctive style that can be associated with Chamba or Nurpur in the last quarter of the seventeenth century. There are several stylistically comparable works from these schools, mostly from Chamba (see Archer 1973, vol.2, p.50, nos.1-3; Goswamy and Fischer 1992, pp.130-1, figs.36-40; Archer 1976, p.21, no.11; Chandra 1971, pp.133-4, no.22 (Chamba); Archer 1973, vol.2, p.302, no.2 (Nurpur)). The Chamba examples cited here have in turn been associated by Goswamy and Fischer with the career of the artist termed by them "The Master at the Court of Raja Chattar Singh of Chamba", who was active from circa 1675 to about 1710 (see Goswamy and Fischer 1992, pp.127-147). It is interesting to note that two of the Chamba examples cited, the Nurpur example and the present painting all concern liquor. In the two Chamba examples they depict a scene of abstinence in which the Raja Chattar Singh is forsaking alcohol - he empties a decanter of wine in a very deliberate gesture suggested by Goswamy and Fischer to be associated with a vow the raja has taken. In the present work and the Nurpur example the scene concerns an excess of alcohol. The episode is known as the "ordeal by liquor" and refers to an episode during Jahangir's tour of the country around Nurpur in 1621 which appears in the Tuzuk-i-Jahangiri ('Memoirs of Jahangir'): "At this time  it was reported to me that there was a Sannyasi Moti in the neighbourhood who had entirely renounced control over himself. I ordered them to bring him that I might ascertain the real state of affairs.... When he came into my presence I examined him, and found a wonderful state of persistence. It occurred to me that in a state of drunkenness and absence of mind and delirium, some change might be wrought in him. Accordingly I ordered them to give him some cups of spirits (‘araq) of double strength. This was done in royal fashion, but not the least change took place, and he remained in the same passive state. At last his senses left him, and they carried him out like a corpse. God Almighty granted him mercy so that he did not lose his life. Certainly there was great persistence in his nature." (Rogers-Beveridge 1989, 2nd of 2 vols. in 1, p.226-7). Jahangir was so impressed that he endowed the Pindori with a temple. In the popular version of this story, the liquor was poison and there was the added element of the same liquid being given to an elephant, which promptly died, further underlining the staying powers of the holy man. That this episode occurred in the Nurpur area may make a Nurpur provenance slightly more likely for the present work, although the style is closer to Chamba. Two further published Pahari miniatures from the late-seventeenth and early-eighteenth century depict this episode, indicating that this theme was a popular one (see Bhatia 1982, p.30, pl.XVII, fig.1 (Nurpur, third quarter seventeenth century); Kala 1961, pl.16 (as Basohli, early eighteenth century).